Google’s Pixel is exactly what the Android ecosystem needs to compete with the iPhone in the high-end smartphone space in terms of quality, performance and reliability. The device is a finely tuned, reliable melding of hardware and software, a strategy Apple has adopted since the iPhone’s inception. More importantly, the Pixel and Pixel XL are built from the ground up by Google, in terms of both design and software, a key element Nexus devices — which are now dead — desperately needed. When it comes to the Nexus line, a Google initiative that consists of my favourite smartphones of all time, contrary to what some might assume, manufacturers like LG and Huawei handled about 90 percent of the design process. 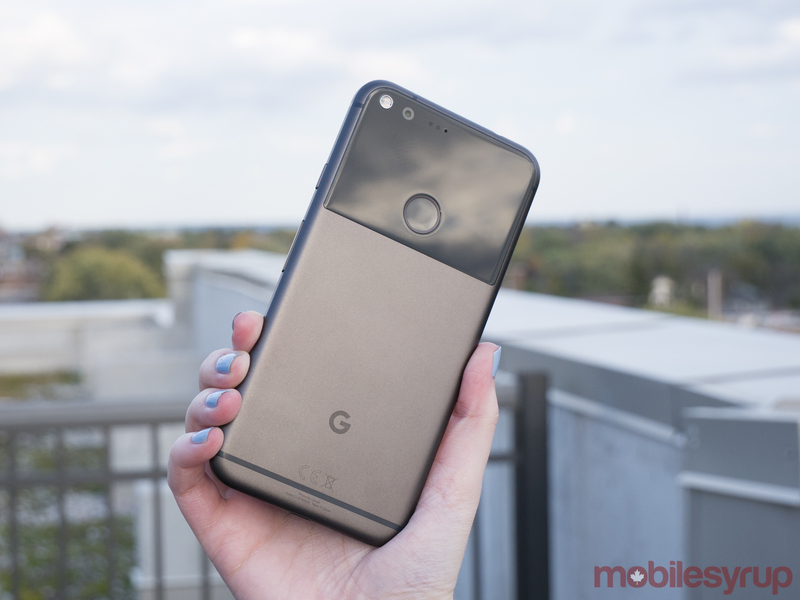 With the Pixel’s creation, the entire development of the phone has been handled by Google. The company even reportedly eventually has ambitions to design its own proprietary chipsets in the same vein as Apple and Samsung. The phone’s manufacturing is handled by HTC, a fact Google intentionally didn’t mention during the device’s reveal, in the same way Foxconn makes Apple’s smartphones and tablets. This is a huge step for Google and a shift that moves the tech giant in line with Apple as an end-to-end hardware manufacturer, with devices like the Google Wi-Fi router, Google Home and the revamped 4K-capable Chromecast Ultra acting as further proof of the company’s new hardware direction. This new strategy is not without its faults, however. As Apple’s walled-garden slowly crumbles with the company opening up various aspects of iOS, such as iMessage and Siri, Google is building its own partially closed version of Android with the Pixel. It’s unclear what result the phone’s release will have on the broader Android ecosystem, particularly given Samsung’s recent Note 7 recall fiasco. Will the Pixel’s high-end build quality push Google’s manufacturing partners to step up their game like Microsoft’s Surface line did when it initially launched? Or will it instead ruin the open nature of Android, making an already disparate operating system even more confusing for the average consumer? 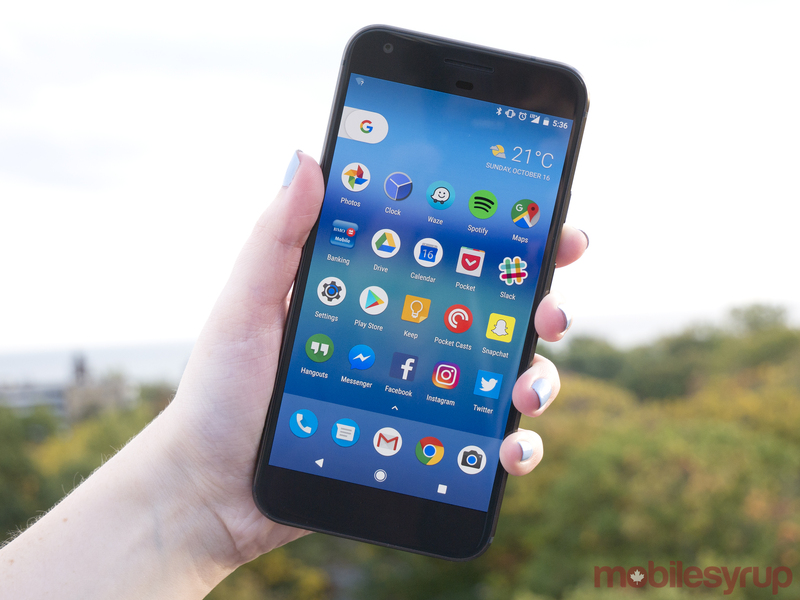 These are questions that are nearly impossible to answer right now as the Android operating system enters uncharted waters with the launch of the Pixel. With all that said, however, let’s dive into the actual device. Visually, both the Pixel and Pixel XL are divisive devices. The phone’s uni-body metal design is minimalist, though it’s difficult to deny that the Pixel doesn’t share aesthetic similarities with current and past iterations of the iPhone. While I agree that at first glance the Pixel looks like it was manufactured from spare iPhone parts, I’d argue that the same can be said about almost any modern smartphone. 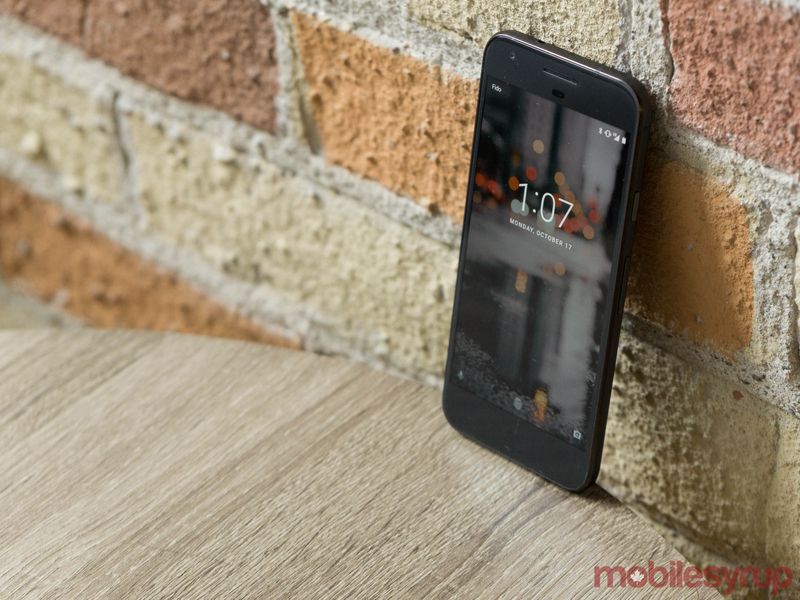 The Pixel’s slightly curved glass and sides give the phone a sleek profile. Its antenna bands are covertly placed on its top, with one also located on its base. An interesting Gorilla Glass 3 backing houses the Pixel’s fingerprint sensor, rounding out the design. 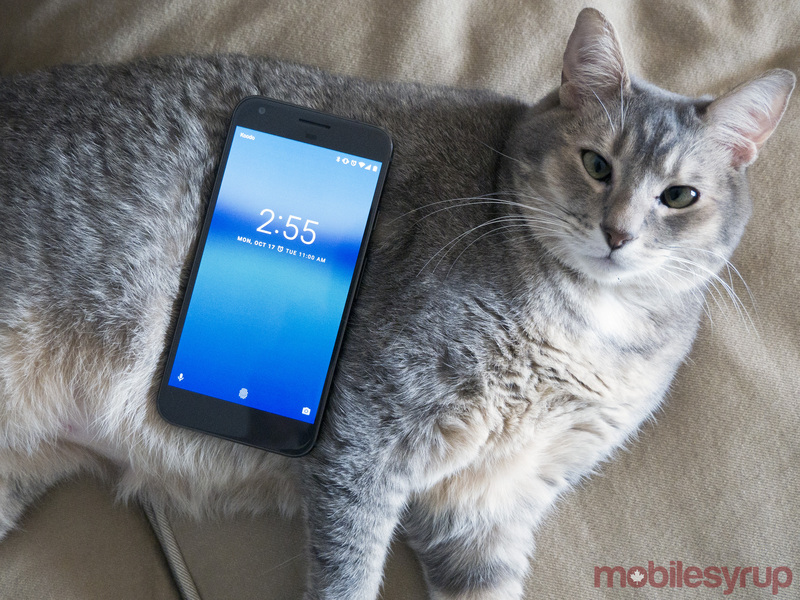 Despite having a great feeling weight to it (168g with the XL and 143g for the Pixel) and an overall air of refinement and quality, the phone will still feel chunky to some, especially when compared to recently released Android devices like the Moto Z and the dearly departed Note 7, though the later comparison isn’t exactly fair given what a disaster Samsung’s latest flagship has become. Specifically, the Pixel and Pixel XL measures in at 8.5mm thick. To put the thickness of Google’s flagship in perspective, the iPhone 7 comes in at 7.1mm. While 1.4mm doesn’t sound like a significant amount on paper, placing the Pixel beside the iPhone 7, Note 7 or even the Moto Z, there’s a drastic difference in girth. Even when comparing this Pixel to last year’s well-received 6P, a phone that’s 7.5mm thick, the Pixel feels considerably larger. With that said, I warmed up to the Pixels’ thickness, especially after recently spending a few weeks with the Moto Z, a phone that I felt was perhaps a little too thin for its own good. To its credit, the chunky nature of the Pixel actually makes the phone feel more solid and durable than its contemporaries. Where the Pixel’s design falters is its large bezel, especially given its home, back and multitasking buttons are located on the screen. There is a significant amount of black space located just under the Pixel’s display. While large bezels are common on Android smartphones, the Pixel’s feels especially large. It’s as if the phone was meant to feature physical buttons, but Google opted to drop the feature at the last second. It’s worth noting that while the buttons are located on the display, it’s difficult to accidentally press them like it was with the HTC 10, a phone that the Pixel unsurprisingly shares design language with. And finally, in a very Apple-like move, a Google ‘G’ sits on the Pixel’s rear under the fingerprint scanner, just in case you forgot who created the device. Overall, I’m a huge fan of the Pixel and Pixel XL’s design, though I will admit I wasn’t at first. As I’ve spent more time with the the phone, however, its look has grown on me, though it’s difficult to deny that beyond its glass backing, the Pixel doesn’t have a standout, unique visual cue. 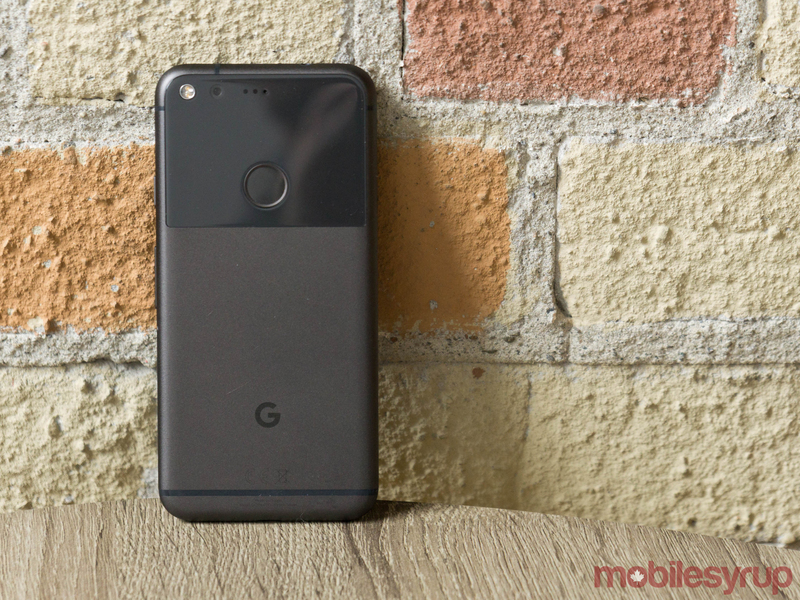 Under the hood, however, is where the Pixel does pack a more reliable and standout punch than any Android device before it. Between the 5-inch Pixel and 5.5-inch Pixel XL, I’ve spent most of my time using the Pixel XL; I prefer smartphones with bigger displays and the larger form factor of the XL speaks to how I use my device on a daily basis. Specs-wise, the only difference between the two smartphones other than size, is screen resolution, with the Pixel coming in at a 1080 x 1920 pixels and the XL measuring in at 1440 x 2560 pixels. The AMOLED display featured in both phones is bright, vibrant and one of the best-looking screens I’ve seen featured in an Android device, rivaling the Note 7’s impressive glass. Videos, games and browsing the web all look spectacular on the Pixel. The Snapdragon 821 rounds out the Pixel’s hardware features, with 4GB of RAM and either 32GB or 128GB of storage, with a 3,450mAh battery in the XL and a 2,770mAh for the regular sized Pixel. While many of these specs are now the standard for high-end Android devices — though the Pixel is one of the first devices to feature the Snapdragon 821 — my time with Google’s phone has been a notably flawless experience. The phone is able to play high-end games, rapidly switch between apps, shoot video, snap photos and most importantly, browse the internet, all with a level of smoothness I have not experienced before with an Android device. While some of this fluidity is likely the result of the Pixel’s Snapdragon 821 processor, it’s also because this is the first Android device where the software and the hardware has been designed in unison. Issues that often affect high-end Android phones like screen lag or typing not being able to keep up with my fast moving fingers, are problems I haven’t encountered with the Pixel, at least not yet. The Snapdragon 821 also actually runs much cooler than the Snapdragon 820 in my experience. 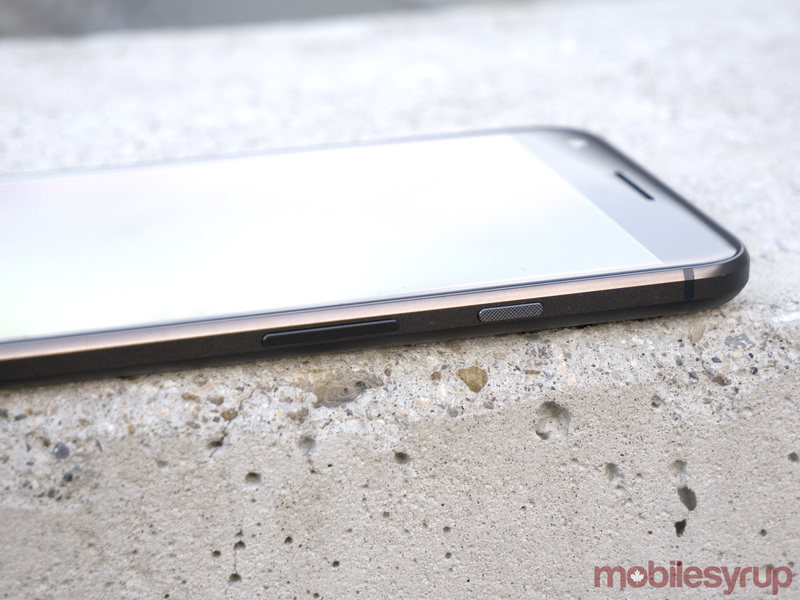 The Pixels’ power button and volume rockers are solid and placed on the right side of the phone. It’s fingerprint scanner, which sits on the rear like the Nexus 6P and 5X, is responsive and in my experiences, works under almost any conditions, even when my finger is slightly damp. The Pixel isn’t IP68 waterproof like the iPhone 7 and instead “IP53 water ingress,” which means it can withstand the occasional splash, but can’t be submerged under water. For some, water resistance is an expected feature with a smartphone in this price range, so this could be an issue. Battery life measures in at roughly a day with the XL, though in some cases I’ve managed to avoid charging the phone until the next morning. While the Pixel features a smaller power source, I’ve found battery life to be comparable across both devices. The ability to charge up to seven hours of battery life in just 15 minutes through the Pixel’s proprietary quick charge technology, is useful as well. 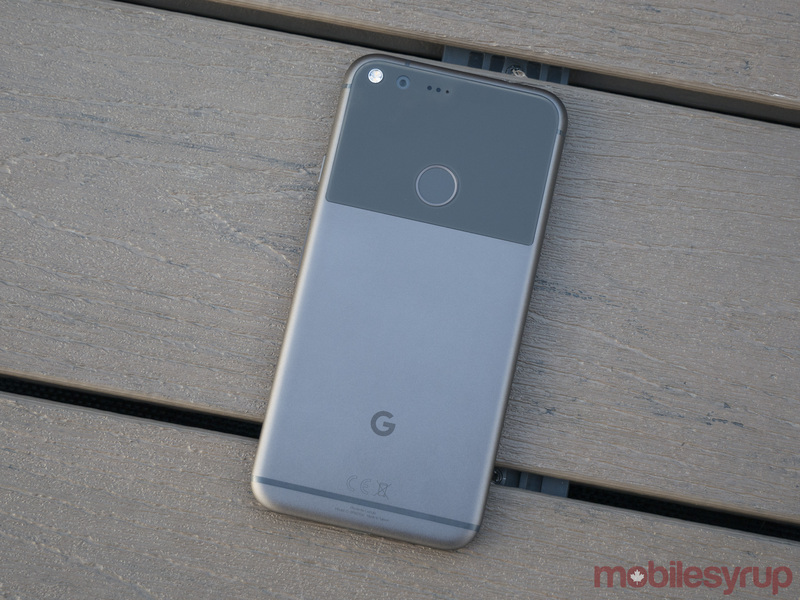 Additionally, and most importantly for some, the Pixel and Pixel XL still feature a standard 3.5mm headphone jack, a fact Google placed cheeky emphasis on during the device’s reveal. As the name ‘Pixel’ suggests, one of the Pixel and Pixel XL’s marquee features is its new camera. 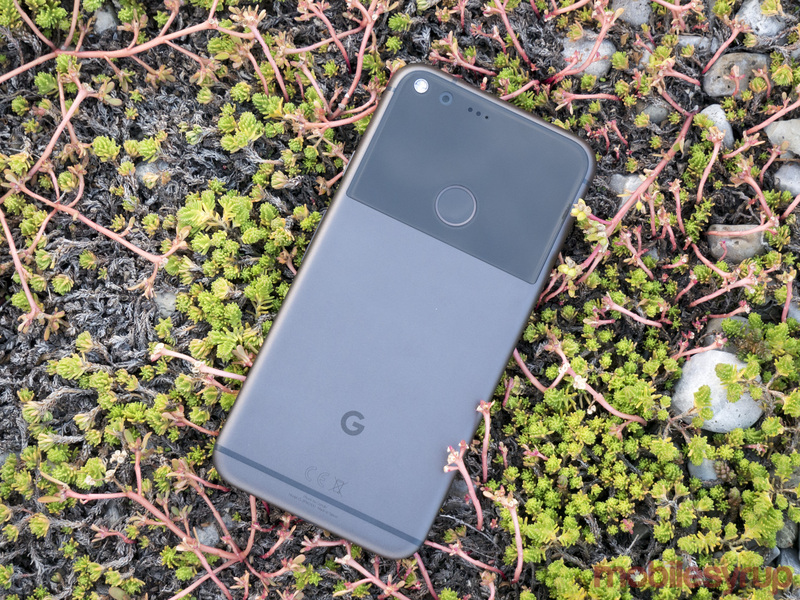 On paper, it may look like the Pixel’s camera features the same specs as last year’s Nexus devices — a 12.3 megapixel camera at f/2.0 aperture and 1.55 μm sized pixels on the back and an 8-megapixel front camera — but in reality, Google’s boasting about its impressive DxOMark seems to be true. It’s not as if the 5X and 6P featured bad camera technology, but as the months wore on, devices with better photography capabilities like the S7 and iPhone 7 hit store shelves, making the once impressive Nexus shooter seem older than it really was. The Pixel’s camera performs excellently under low-light and natural light, though the phone’s lack of true image stabilization seems to sometimes cause issues, especially under low-light conditions. These focusing problems rarely occurred, but sometimes when trying to snap photos quickly while jostling the phone around, the resulting shot ended up blurry. Google claims that some level of image stabilization is handled through the phone’s gyroscope, but in my experience, I found it didn’t always work very well. With so many high-end smartphone cameras snapping great photos in 2016, it’s difficult to say where the Pixel falls. Comparing shots with the iPhone 7 Plus, my favourite smartphone shooter, reveal that under almost all conditions, with the exception of low-light, the Pixel can certainly hold its own. On the plus side, both the Pixel and Pixel XL feature EIS video stabilization, a new feature Google showed off during the phone’s unveiling that makes videos look like the were shot with the phone placed in a gimbal; yes the video stabilization really is that impressive. I’d even go so far as to say that at least at first glance, EIS stabilized video shot with the Pixel rival the video that comes out of Panasonic’s upcoming Lumix G85 micro four thirds camera, which features 5-axis body stabilization. The Pixel’s image stabilization is very impressive and the kind of feature that’s only possible when the software and hardware of a device are designed to operate in unison. The ability to backup all images in their original quality for free via Google photos, a feature that’s exclusive to the Pixel, is also convenient and extremely useful. With the voice-assistant AI wars slowly heating up, one thing is already clear: Google Assistant is significantly ahead of Apple’s Siri. 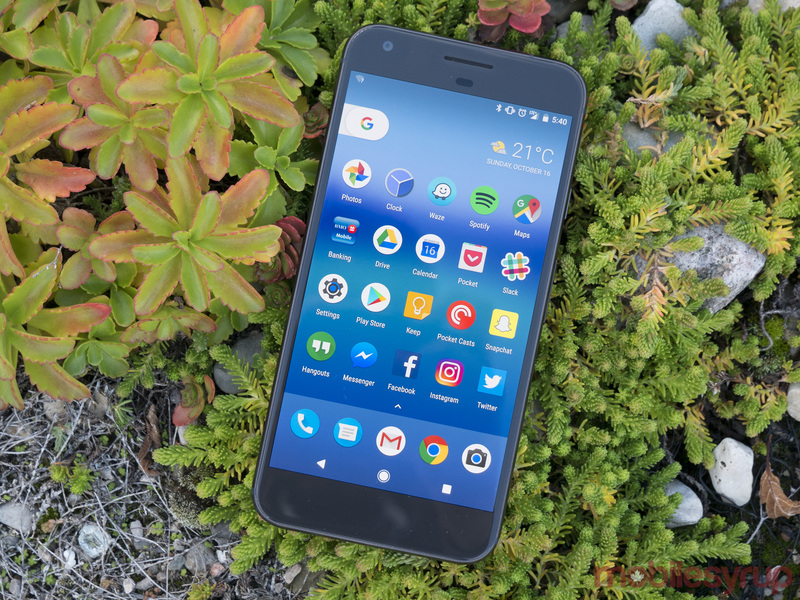 While the Pixel and Pixel XL are the first devices to feature Android 7.1, Google has also launched new offshoot features, which it says are exclusive to Pixel devices for the time being. 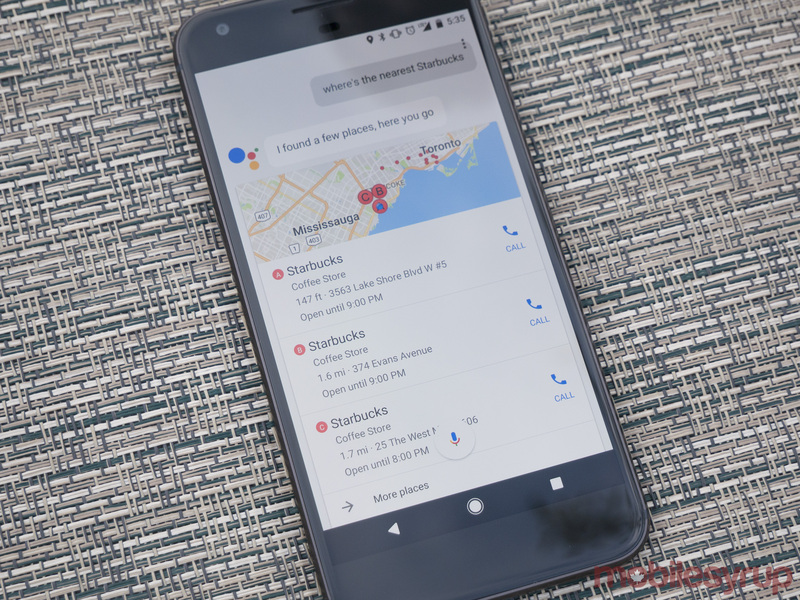 Anyone who’s played around with Google’s Allo will be familiar with Google Assistant, a voice-activated assistant that scours the phone’s screen for search terms and responds to user questions, similar to previously launched Now on Tap. 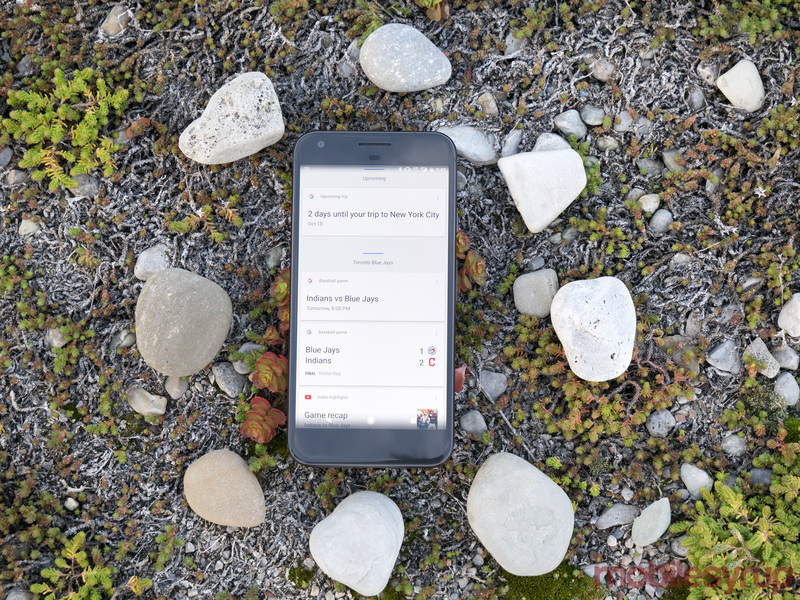 What makes Google Assistant different, however, is its conversational nature, which makes it significantly more contextual than Google Now or Now on Tap. Assistant is always collecting data from Google’s various services, including apps like Gmail, as well as Chrome web browsing activity. While this is likely a privacy issue for some, giving up your entire life to Google’s Skynet gives access to the first virtual assistant that I’ve actually found useful. Saying “Ok, Google” springs the assistant into action (you can also swipe up from home button to activate Google Assistant). A new window pops up in the lower section of the screen and a speech-to-text conversation tool launches. You’re then able to ask Google Assistant questions like, “Where is the nearest Starbucks?” to which the AI will respond with Google Maps-specific locations where you can purchase overpriced, fancy coffee. Where things get interesting is what you’re able to do next. For example, if you happen to have a follow-up question related to when that Starbucks location closes, simply tap the screen again and ask when that location will set to close. You don’t to clarify that you’re still talking about the same location; Assistant is smart enough to follow a conversation. While similar functionality is built into Google’s Allo app, having Google Assistant always-listening and available with a simple voice command or swipe, has made me actually use an AI for the first time. I’ve found it very difficult to come up with a question that Google Assistant doesn’t have some sort of answer to and I’ve never been able to say the same about Siri, Microsoft’s Cortana or Amazon’s Alexa. Furthermore, rather than respond in a robotic voice like Siri, Google Assistant displays a text confirmation that your question has been received and that the task is currently being accomplished. 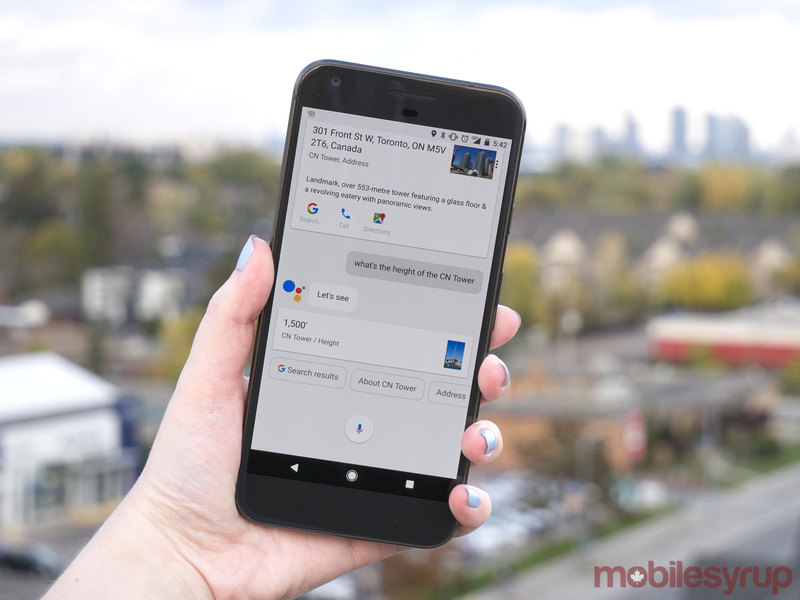 Responses are also speedy, significantly more so than Google Now and all in, Google Assistant is able to answer questions faster and more accurately than Siri. Google obviously has prowess in the search space because it’s behind the world’s most popular search engine and it seems like the company is finally harnessing that power through its mobile operating system in a way that makes sense. If Google Assistant is able to find an audience, it’s possible it could replace standard Google searches in a couple of years; yes, it really is that good. Google Assistant integration isn’t the only exclusive feature the Pixel is getting, the phone also includes a brand new Android overlay. While some have criticized the Pixel’s circular icons, I feel like they add a much-needed level of polish to Android’s sometimes confusing operating system. The ability to swipe up to launch the dock is also a great decision on Google’s part and I’m surprised that one of its partners, particularly Samsung, didn’t implement a similar feature years ago through its own launcher. While Android has always been a pretty operating system, the rampant skinning often done by manufacturers, particularly companies like LG, Samsung and a string of mid-range OEMs, have resulted in an operating system that never had a clear, concise identity. Sure, stock Android has always been the clearest vision of what Google wants its mobile operating system to be, but it’s always felt like the company was holding back with devices like the 6P and 5X in order to give its partners a blank slate. With the Pixel, that hesitation to add new exclusive features and a cleaner aesthetic direction are gone. How this changes the broader Android ecosystem remains unclear, but in the context of the Pixel, this is a welcome shift. The Pixel and Pixel XL are high-end devices with expensive price tags, with the latter fact coming as a shock to many fans of Google’s now-dead Nexus brand. Whether or not the cost of admission and significant price increase over the 6P and 5X are worth it will come down to what you value from a smartphone. I’d contend that while both the 6P and 5X were great devices, they’re severely lacking in certain areas, particularly build quality. 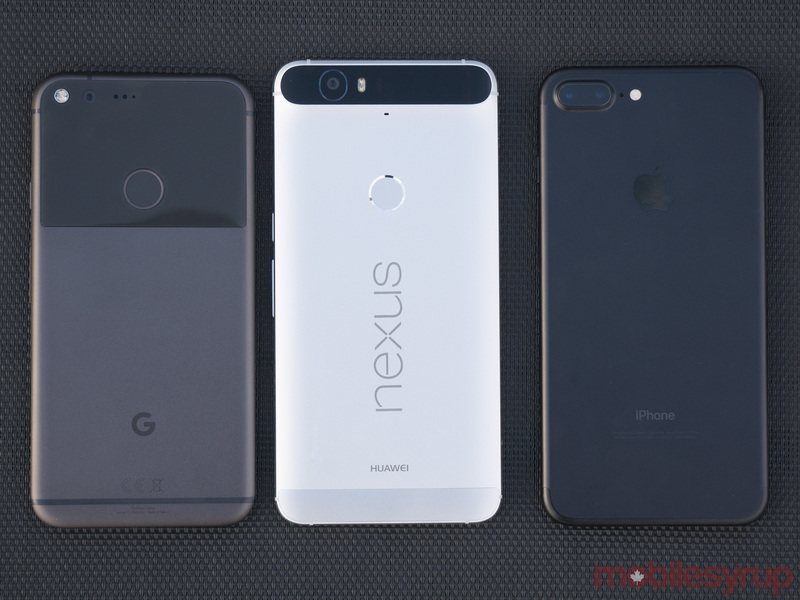 So while the Pixel and Pixel XL are expensive, starting at $899 CAD and $1,029 CAD respectively, this cost puts the phones in line with the devices it’s vying to compete with like the S7 and iPhone 7. If you’re looking for a more affordable device with a mid-range price and high-end specs, there are great options out there. Smartphones like the OnePlus 3 and even the Axon 7 instantly come to mind and it’s not as if these devices are going anywhere when the Pixel launches. While the Pixel and Pixel XL might not be the smartphone for everyone anymore, the high-end devices are exactly what the Android ecosystem needs right now. Make no mistake, the Pixel is the Android device you’ve been waiting for. 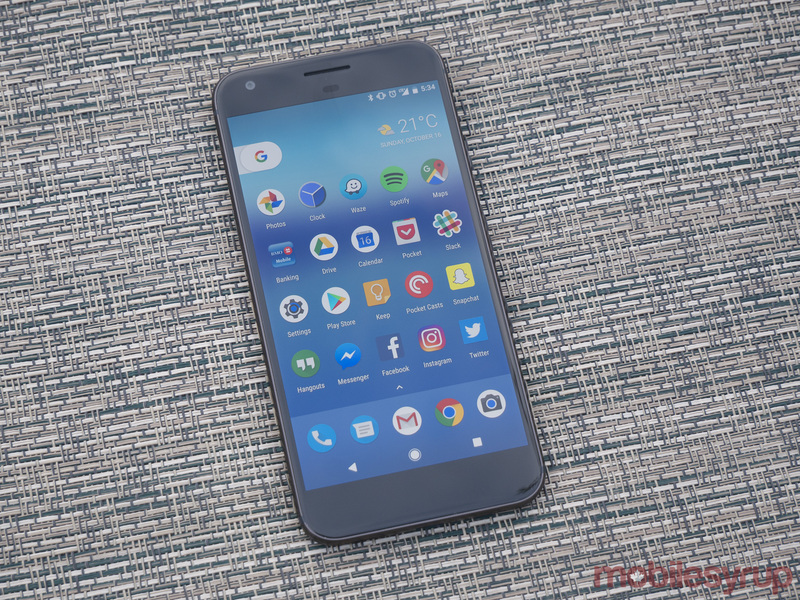 The Pixel is set to be available on October 20th through the Google Store as well as at Canadian carriers. 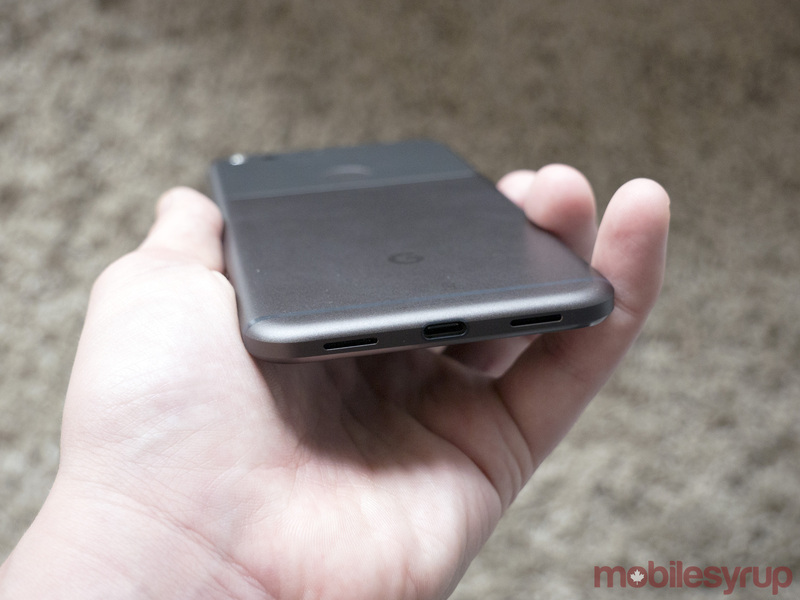 The Pixel is the five-inch smartphone I’ve been waiting for Google to make since I first dipped my toes into the Android ecosystem with the Galaxy Nexus back in 2011. The company has created a palm-sized smartphone that isn’t a compromise; the Pixel features impressive internals, a bold new take on Android, and, at long last, a camera that is not a liability in all but the most favourable lighting conditions. As with all Android devices, we’ll have to wait and see how the Pixel performs down the road (lest it be forgotten, Android lag is still a very real thing), but after one week with the device — far too little time, I admit — I’m happy to report the Pixel is a joy to use. Unlike the Nexus 5X, which suffered a number of performance-related issues that no amount of software tweaking by Google seemed capable of fixing, the Pixel is snappy, and I’ve yet to see any apps crash or hang up. Similarly, Assistant has also been a revelation. In the past, I’ve seen little utility in personal assistants like Siri and Cortana, but with its ability to correctly parse speech and infer context from previous queries, Assistant has won me over. I can see it becoming a favourite feature of many future Pixel users. Granted, unlike the Nexus 5X, the Pixel costs $899, $450 more than the $449.00 I paid to get my 32GB Nexus 5X last year. Given its less than stellar looks, some may end up scoffing at the price, but given how few small high-end smartphones there are out there, particular in the Android ecosystem, this is the 5-inch smartphone to get. Igor Bonifacic also contributed photography to this review.